There is an ongoing attack against users where servers raise exceptions when a client broadcasts a transaction; in this case the error text is displayed as is in the client GUI. 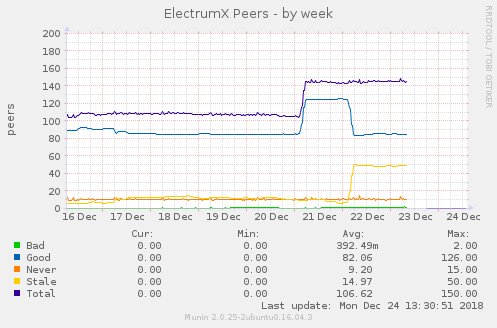 The attacker has spawned lots of servers on different /16 IPv4s to increase his chances of being connected to. 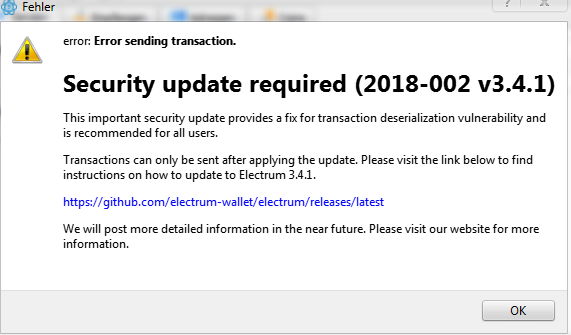 The error messages are trying to get the user to download and install malware (disguised as updated versions of electrum). In relation to #4953, we were privately sent a screenshot that was apparently floating around a German chat room (on 2018-12-21). We should also show some additional explanatory text at the beginning (prepend something). For context, this mechanism of the server returning error message text to txn broadcasts is used to display error messages originating from bitcoind, such as low incremental fee or missing inputs, etc. We did not publicly disclose this until now, as around the time of the 3.3.2 release, the attacker stopped; however they now started the attack again. This is on server plmimservice.bitcoinplug.website on mainnet. Notice there are 7 *.bitcoinplug.website domains. There are 6 *.imaginarycoin.info domains. There are 9 *.23734430190.pro domains. There are 7 *.cryptoplayer.fun domains. There are 4 *.krypto-familar.fun domains.